Oh yes, the best way to spend a hot afternoon in the yard with friends: sipping sweet sangria or ice-cold, frothy margaritas. Yum. Sangria is best served by the pitcher and margaritas are best when they are freshly shaken (vigorously) with ice. So next time you're hosting a gathering, you can accomplish both quite painlessly. To avoid watering-down your adult beverages, always serve your ice on the side. Mix it all together and chill it in the refrigerator overnight. Before serving you can add halved and wedged citrus, frozen raspberries, and sliced peaches to the pitcher. However, if you're using a beverage dispenser with a spigot (like mine) you might want to avoid this, as the fruit may clog your spout. To serve, provide plenty of ice and garnishes (sliced citrus, raspberries and/or peaches) on the side. Serve with or without a salted rim. To serve in mason jars, place all the ingredients in the jar with NO ice (with the lid on). 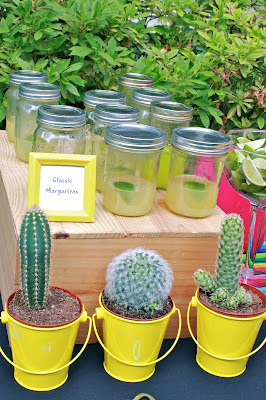 Keep the jars chilled until you serve them (we brought ours out 12 at a time for the party). Place an ice bucket with scoop on the side. Instruct guests to remove the lid, fill the jar with ice, replace the lid, and then shake-shake-shake. Provide a container to collect discarded lids.